Ripe Lemons : 20 nos. Red chilly powder : 3 tbsp. (as per your spice level). Gingelly oil / Sesame oil : 2 tbsp. I know there are multiple ways to prepare lemon pickles. 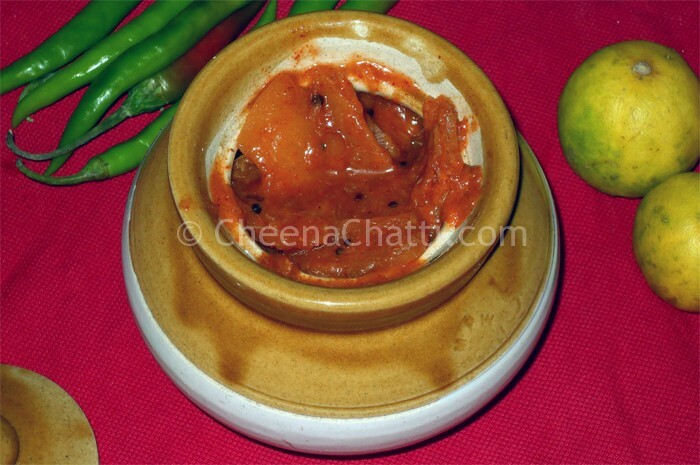 But this recipe helps you to make the naranga achar / lemon pickle in Kerala style without any bitterness. As usual the source of this recipe is my sweet mother (who is the best cook I have seen). Select 20 numbers of ripe lemons and wash them thoroughly. Pat dry them and steam the lemons in a vessel for 8-10 minutes. (Do not overcook them, then you cant slice them). Remove from the flame and allow it to cool and then dry the lemons using a clean dry cloth. Slice each of the lemon pieces into 8 pieces. If they are small ones, slice them into 4-6 pieces. Add garlic, green chillies, put in a tbsp of salt to the sliced lemon and mix well. In a kadai / cheenachatti / pan heat the gingerly oil and splutter the mustard seeds. Lower the flame and add the chilly, saute for some seconds. Add the sliced lemon pieces, garlic, chilly mix to it. Mix it well and switch off the flame. Add asafoetida powders, curry leaves and saute it. Taste it and add extra salt if needed. Add the vinegar and transfer everything into a dry bharani /glass / ceramic jar. Heat 2 tbsp of gingelly oil and allow it to cool and then pour the oil on the top of the pickle. This will prevent fungus growth and gives it an authentic taste. Start using the lemon pickles (naranga achar) after 3-4 weeks. Clean the jars with hot water and make sure the jar and lids are dry before you use them for storing. When you serve them, use clean dry spoons to avoid contact with water. Titrate the chilly powder level depending on your tolerance. Keep the flame lowered while adding spices else you will burn them. This entry was added on March 8th, 2014 by Cini P Moideen in Condiments and tagged with kerala pickles, lemon pickle recipe, onasadhya, cheru naranga achar recipe, lemon pickle kerala style, kerala lemon pickle, sadhya, pickles, sweet lemon pickle. Last revised on March 27th, 2018.
hmmm..liked this..if you don’t mind sharing this. Thanks for trying the recipe and dropping your comments Mohan. Don’t forget to try our other recipes too.. I make a sweet and sour lemon pickle. Firstly I slice the lemon into small pieces and remove all the seeds as the seeds make them bitter. I add vinegar to the lemon with a pinch of salt and sugar. I let this mature for about a week to form a sauce. I make a sauce with vinegar and maizena by boiling this together. To this add sugar and salt. Lastly I braise mustard seed and cumin seed. Once the oil is still warm, add pickle masala and tumeric. To this add fresh ginger and garlic. Mix maizena to this mixture and add to the lemon. This would last for about 2 months. @Priscilla Chetty: I was unfamiliar with maizena, and a google search returned it as corn starch. Is it correct? I came across this recipe mainly because i was looking for a recipe to make lemon pickle without the bitter taste. Which step of this recipe takes away the bitterness of the lemon? I love a kind of lemon pickle which is served along with Biriyani in Thrissur and surrounding places. There will be enough gravy. I made lemon pickle exactly the same way your recipe mentioned, but i added water. And it ended up very bitter. I wanted to make lemon pickle for my son, for regular use as he likes it very much. I want to make it with enough gravy and not bitter. I don’t want to preserve it for long. Any suggestion would be helpful. Bobby, sorry to hear that your preparation didn’t went well as expected. This is the same way we prepare lemon pickle at home, and I can assure you that it never turned bitter. Not sure what went wrong in your preparation. Can be due to the lemon, on some ingredient? Also, We will never add water to the pickle. This can spoil it easily.